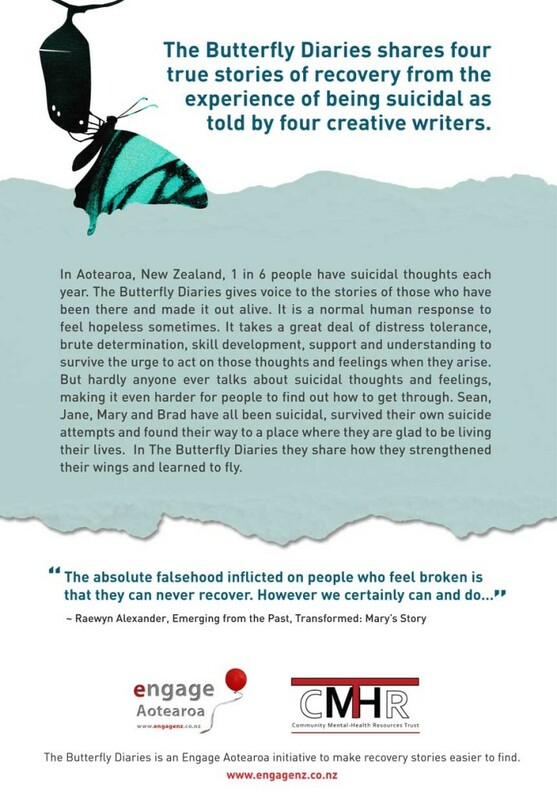 Four true stories of recovery from being suicidal as told by four creative writers. Read our first review! Read our second review! Foreword by Mike King. Stories by Raewyn Alexander, Henrietta Bollinger, Owen Bullock and Phoebe Wright. Edited by Miriam Larsen-Barr and Michelle Bolton. 62 page, perfect-bound, paperback with colour cover. The Butterfly Diaries is currently out of print and orders are closed for the time being. Contact us for more info. The Butterfly Diaries is free for individuals in the community, but we ask that you make a small donation to help the project continue, if you can. To order a copy for yourself or someone else, just send us an email. If you can’t afford to make a donation, still email us. We will send you copies anyway. The minimum suggested donation for individuals is NZ$2.50 per book (the cost of postage and handling). Adding extra to your donation helps us to print more books. Organisations can still order books too. We ask that you make a minimum donation of $5 per book. This allows us to keep copies available for individuals who may not use services. If you can’t afford the minimum suggested donation for the number of books your service needs, contact us. We are dedicated to making copies available. Delivery takes two weeks. 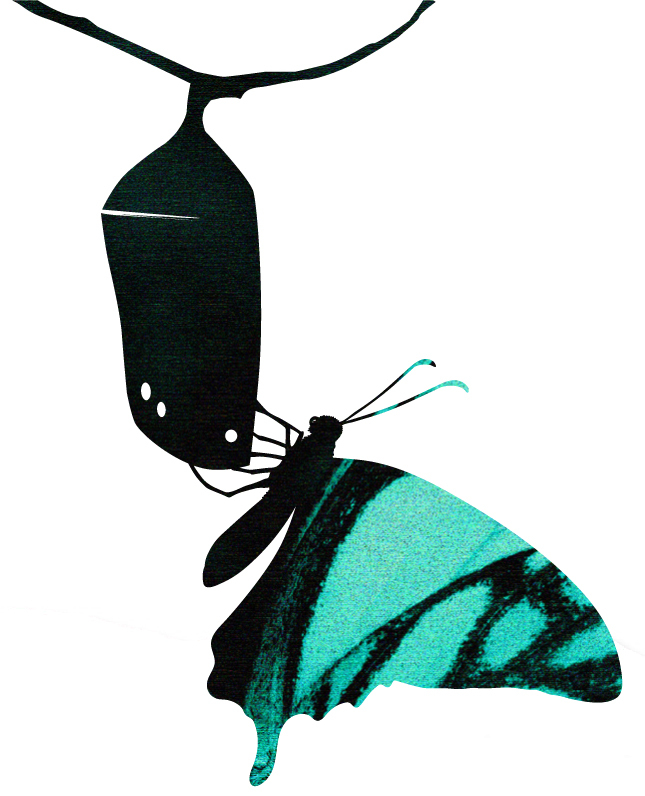 The Butterfly Diaries is currently out of print and orders are closed for the time being. Contact us for more info. For every $5 you add to your donation, you cover the costs of printing and posting another copy to someone else who can’t afford to make a donation. Donate to print more books. If you’ve already ordered books and want to support the project, you can also make general donations on the main Engage Aotearoa Donations page. Organisations and individuals who sponsor a print run can nominate a school or community group (or their own service) to receive part or all of their sponsored run. Your contribution to your community will be acknowledged on an insert in the front of each copy you sponsor. Alternatively, your contribution can be anonymous if you would like. 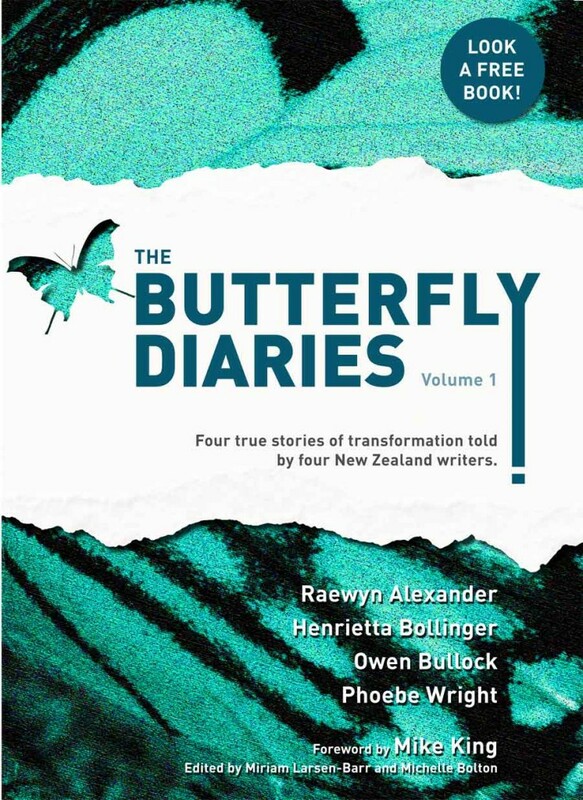 The Butterfly Diaries is a nonprofit initiative from Engage Aotearoa, produced by volunteers with lived experience of recovery who want to be part of positive social change. Engage Aotearoa is unfunded, staffed entirely by volunteers and relies solely on donations to cover the costs of operating.